While current affairs publications largely ignore political shifts leftwards, radical ideas are finding an unexpected new home: fashion magazines. 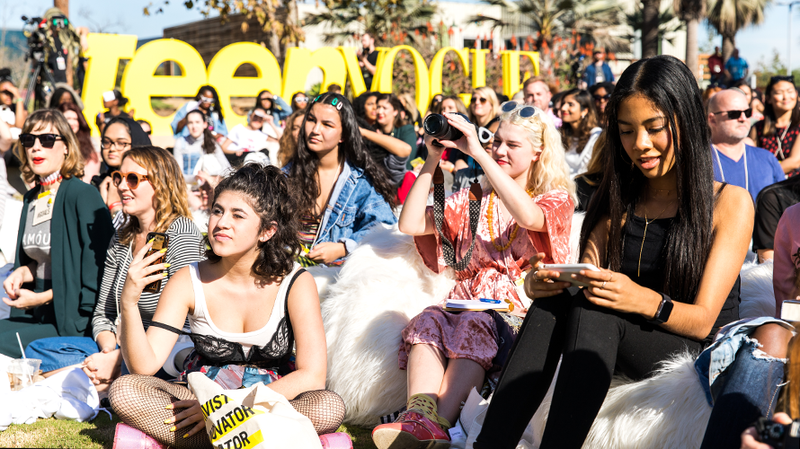 Teen Vogue's inaugural Summer Summit in 2017. The reasonably serious treatment given to many of Karl Marx’s ideas, on the 200th anniversary of his birth last year, was surprising to some. 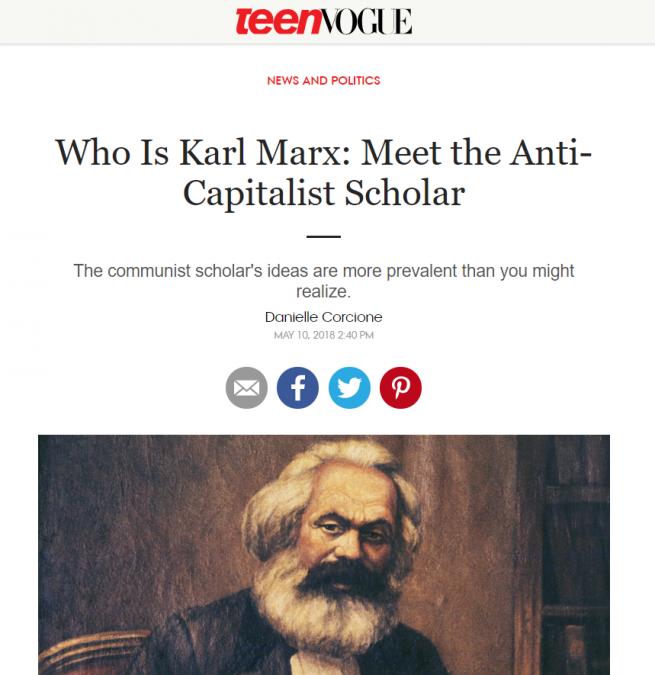 The Economist declared, “Rulers of the world: read Karl Marx!” Another seemingly unlikely publication asked, “So how can teens learn the legacy of Marx’s ideas and how they’re relevant to the current political climate?” That publication was Teen Vogue. In her 1998 book, British Fashion Design, the cultural theorist Angela McRobbie argued that the editors of magazines like Vogue clearly believed fashion ought to avoid politics, and that fashion journalists were expected to comply. Fashion-as-politics might at times appear in the magazines’ pages, but only as “a catchy idea for a ‘fashion story’.” While these magazines clearly wanted to avoid being associated with “mass culture”, and most editors were “unashamedly elitist in their desire to create a luxury magazine for well-to-do readers”, she noted that fashion simultaneously saw itself as occupying a lowly position within “high culture” (as well as within serious journalism). McRobbie argued that the result was “an inward-looking and culturally isolated group of fashion media professionals who seem to belong to a time when politics did not intrude on the world of fashion and when fashion people had no need to dirty their hands with what went on in the outside world”. Ever since Trump’s presidential election campaign, however, U.S. fashion magazines have provided considerable coverage and commentary on resistance to the administration – and particularly to the reactionary gender politics of Trump and the “alt-right” – with no fashion “hook” at all. And yet, one constant with McRobbie’s account of fashion journalism is that Vogue continues to act “more or less as a universal benchmark of quality”. Although it is the magazine’s sister publication, Teen Vogue, that is the real vanguard today, stetting new benchmarks for political coverage. The magazine has covered Black Lives Matter. It’s run an #AskaNativeAmericanGirl series, including interviewing two teenagers from the Standing Rock Sioux tribe protesting against the Dakota Access Pipeline. It’s carried articles defending the right of young trans people to access bathrooms that correspond with their gender identity – in schools and elsewhere. And it’s featured conversations between the transgender model and actress, Hari Nef, and the gay electro-pop star Troye Sivan, talking about queerness and taking part in anti-Trump protests together. Teen Vogue‘s article on the 200th anniversary of Karl Marx’s birth drew predictable outrage from right-wing commentators in America. Teen Vogue might be taking the lead, but others have often been close behind, particularly in coverage of the women’s strike organised on International Women’s Day, shortly after Trump’s 2017 inauguration. Glamour explained “The strike is a lot more than just a response to Trump: Organizers want to combat decades-long socioeconomic inequality by calling for marginalized communities – working women, women of color, Native women, immigrant women, Muslim women, disabled women, and lesbian, queer, and trans women – to come together and make their voices heard.” Marie Claire explained that the strike was partly “inspired by the ‘Bodega strike’ in New York City, when Yemini-owned bodegas [or small grocery stores] shuttered their stores in response to Trump’s immigration ban”. It carried instructions on how to participate. Elle magazine ran an article pointing towards some of the difficulties of a women’s strike, once we recognise the importance of unpaid emotional labour disproportionately performed by women. “It’s easy to take off work and stop shopping, but do you also spend the whole day forgetting birthdays and refusing to smile?” (A smile strike was in fact one of the actions proposed by organisers.) The article included a lengthy quote from Friedrich Engels on the general strike, reference to Rosa Luxemburg on the mass strike, and a link to a scanned PDF of a 1975 article by the Marxist feminist Silvia Federici on the Wages for Housework campaign. What might explain the growing attention of these magazines to politics, and particularly left and progressive politics? First: one response to the digital challenge posed to print media in recent decades has been a diversification of fashion and other magazines across multiple markets. Newspapers’ fashion coverage has long competed with magazines like Vogue, but these magazines now also often compete with others’ political news and commentary (particularly online). Second: advertising revenue has always supported fashion journalism, yet this revenue increasingly derives from online click-throughs from social media, including by readers who come for the politics and may or may not stay for the fashion. Third: from Black Lives Matter, over opposition to the Dakota Access Pipeline, through to the death of Heather Heyer at a protest against white nationalists in Charlottesville, women (as well as queer people) are playing a leading role in resisting the reactionary politics of the Trump administration and the alt-right. It makes sense, then, that particular attention is paid to these movements by magazines traditionally read by women and girls (and which have often served as camp objects of identification for gay men and others). Finally, McRobbie argued that fashion writing in the late-90s was, distinguished, as Roland Barthes claimed in The Fashion System, by a “systematic euphoria”, forbidden from offering “anything aesthetically or morally displeasing” or from “contact with evil”. If this ever was sustainable, in times as bleak as our own, this is certainly no longer the case. This article was originally published at the Tageszeitung. Ben Trott is based at the Faculty of Cultural Studies of Leuphana University, Lüneburg, Germany.